Lemongrass is a very strong plant that can actually help to deter swarming gnats. I love using this instead of commercial products because it smells better and I find it to be more effective. Not to mention, it is safe to use around children, pets or other sensitive people. Thus, immediately I was looking for a solution to finally get rid of the nuisance that is swarming gnats. 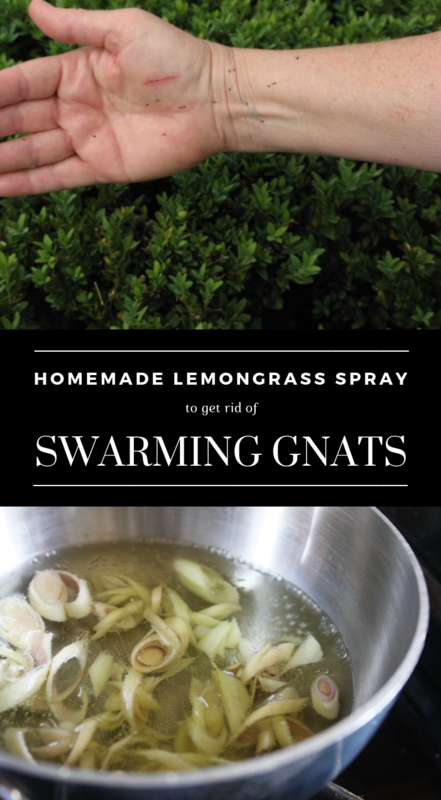 Hence, keep reading and try this homemade lemongrass spray to get rid of swarming gnats from your garden. You can make this homemade solution in two ways. The first one is by using a handful of lemongrass stalks and the other one, which is faster, is by using the lemongrass essential oil. This involves making a tea by steeping a handful of stalks for 20 minutes. The water will look red and you can even raise the stakes by slowly simmering the stalks in hot water for a few hours. If you want this solution to have a longer life, fill a canning jar with lemongrass stalks, add 2 drops of witch hazel and add 10 tablespoons of vodka. Let this mixture sit for about 5 weeks out of direct sunlight in a relatively cool spot. Lastly, strain the mixture using a cheesecloth and pour it into a clean spray bottle. This is faster but the oils are quite harder to find and they seem to be more costly. But if you find this to be more accessible to you, here is the method. All you need to do is mix 5 drops of lemongrass essential oil per an 8-ounce bottle of distilled water and 2 tablespoons of olive oil. Simply spray it directly on the swarming gnats because it will be effective instantly.